This book is tribute to an inspiring, talented lady still missed by all her pupils. 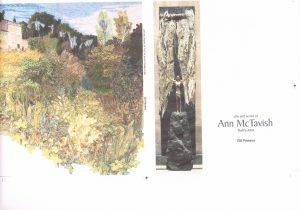 There are many illustrations of Ann’s works showing her development through styles, from large wall hangings to small “house ornaments”, as she described pieces influenced by her Italian visits. One chapter describes her co-operation with the sculptor Arthur Dooley producing a piece entitled “Redemption”, which is on view in Liverpool Cathedral. Ann found a new way of working for this piece, using dissolvable materials to produce her own. Such techniques were new at the time. This work is very moving and well worth a visit. There is a section of pictures Ann’s own works, showing her skill in using different styles and materials. There is also a Gallery of pupils’ pieces and some moving tributes. The author was one of Ann’s pupils and this book is moving tribute. A purchase at an auction leads the heroine Charlotte into meeting famous late 18th century names and solving a personnel mystery. 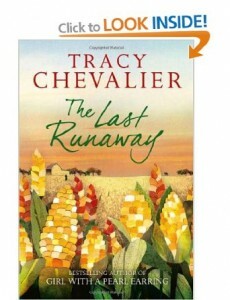 The author gives a convincing picture of living in Spitalfields, London and village life in Essex. 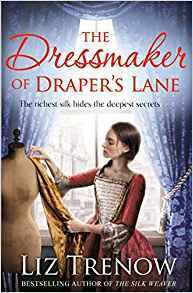 This story follows on from “The Silk Weaver”; there is less description of material production but details of fashion are included as Charlotte meets her customers; she is an unusual woman running her own business in the late 18th century. Each chapter is headed by a technical description of a material or accessory. The author has researched her period, introducing the Hogarth sisters, David Garrick and the system of the Foundling Hospital, which plays an important part in the story, blending into the action and keeping the plot moving. This is a relaxing read with a refreshing approach to the period. The characters read well and fit into the scenery and plot, from the over-bearing vicar to Mrs Taylor, the supervisor in the sewing room. The cover of this book first attracted because of a wandering gold thread. 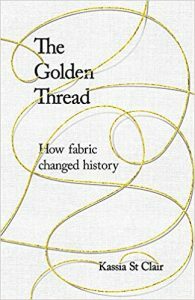 Near the end is a chapter devoted to working with gold thread, so I read it first. Remember the Spider Cape in 1912 shown in V&A and national press? The penultimate chapter is devoted to the people who developed this material, which makes fascinating reading. The author invited the reader to take a closer look at the fabrics in daily life. Each chapter contains very different stories that help illustrate the significance of very different threads. From unwrapping Egyptian mummies to developing space suits, the information is eclectic and fascinating. Whether natural or man-made the human race has always lived surrounded by cloth; speech contains many words and phrases in which the production of thread and cloth have insinuated themselves, eg “line”, “lining”, “lingerie” are also rooted in the word “linen”. The author proves by her scholarship and research that the study of fabric is not a Cinderella subject. The production and history of fabrics is for the curious and informed. Take a chapter a day. This large format book contains beautiful illustrations of many pieces held in the Guild’s collection, pieces date from Tudor times through to 20th century. All show different blooms worked in a myriad of methods and stitches. The author has separated the examples into various categories; monochrome, using evenweave material, applied materials, symmetry or irregular designs. Although no actual patterns or instructions are included the pictures show how each is worked. Names of donors and date of inclusion in the collection are given; the fact that some were saved from destruction or being sold at jumble sales is also mentioned. Catalogue numbers are included so favourite ones can be checked and requested when readers visit Aylesbury. The title of this fascinating story is very apt, as there are so many threads linking famous people of 1930s with others of 1970s. The hero is a sick ex fisherman who spends his good days painting or embroidering. Much of his output has disappeared but according to exhibition reviews and eyewitness accounts was produced by a man who knew the sea in all its moods. Medical science of the day could do little to help his condition, described as “a stuporous state”. Continually tended by his devoted wife John lived a quiet, almost death-like life. Various notorious people visited, purchased his paintings and encouraged his talents. This story links the lives of many people, including the author and her husband. Some are unexpected, like Peter Pears and Albert Einstein. 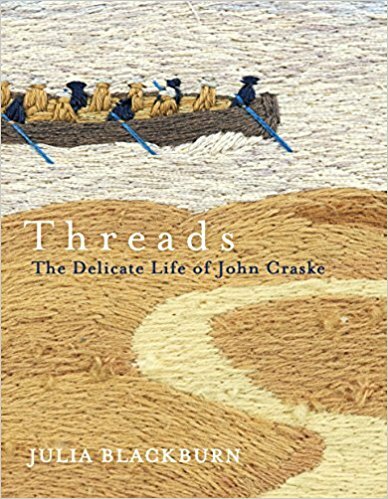 The best chapter, from an embroiderers’ view, is about Craske’s embroidery of the Evacuation of Dunkirk and includes photos of the work; this should be seen by more people, especially those who understand the skill in producing it from his sick bed. It is like a detective story, with the author chasing clues in unexpected places while the atmosphere of Suffolk and the east coast permeates the book. the secret story of Quilts and the Underground Railway by J L Tobin & R G Dobard. 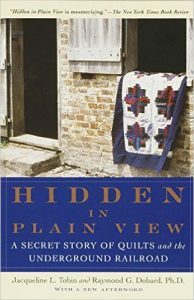 This book describes the many patterns used in 19th century quilts in southern USA and the discovery of the significance of the patterns. Until comparatively recently the coded messages in such quilts have been unknown due to the oral tradition of the makers. Even family members were unaware that heirloom items had such importance to escaping Negroes before emancipation. Ms Tobin is an historian who was given the information by one of the last quilt makers in Charleston, Louisiana. The strong connections with West Africa, from where the natives were forcibly moved, influenced their designs. Professor Dobard was an experienced African American quilter who helped to unravel the story of the importance symbols giving directions to the fugitives. There is an extensive bibliography and helpful glossary and diagrams of designs. Ms Knight takes her readers through the treasures she finds in the family button box, an item most readers can empathise with. Each treasure brings forth her family, memories and events connected with the button. Sometimes she elaborates into social memories, how her aunts impressed her with their needle skills and escapades. There is much about the make do and mend of the war years. Her grandmother was a strong influence as was gran and mother where sewing was concerned. Gran’s silver thimble was included and the memories handed down through the female line. Throughout the book the gradual freeing of women from domesticity into the wider world, either social or necessity, is discussed and expounded. A small ladybird button reminds the author of her childhood, the gap between those who had and the children who were made to feel the stigma of not having, through no reason of their own; the numerous layers of underclothing worn by all who could afford; the delights of reading various comics that even now causes some to become misty eyed. This book certainly presents a new view on the history of women’s intimate lives with domestic duties, families work and fashion. Some of the chapters may make the reader laugh or nod in agreement .Lynn Knight’s book gives a new meaning to micro history. 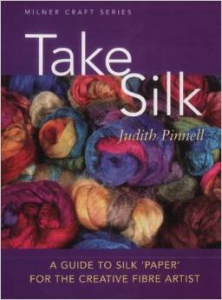 This book will take the reader into a world of colour, creativity and an exciting new dimension in textile art. Thus the blurb begins on this lovely paperback. The illustrations in the project section are magical; the photographer deserves much praise. The author delights in making silk paper then transforming it into many desirable objects, bowls, masks etc. Follow the clear instructions to make your own lovely items. Machine embroidery dominates but the hand stitcher is also catered for. The instructions appear clear and various materials can be used to enhance the designs. This book contains 12 months of sewing lessons, following a group of beginners learning to use their sewing machines. Each detailed lesson plan includes easy-to-follow instructions, advice on buying fabric and other necessities. The first third of the book has interesting chapters on the sewing machine, which should be of great help to people who are complete beginners. Choosing materials is discussed before the projects start. Each one may appear simple but they contain different skills that help the sewer progress with confidence. Being an American publication there are quotes from pupils alongside the progress; perhaps schools over there do even less stitching than UK ones have taught over the last few years. Subtitled “stylish solutions to give your clothes a new lease of life”. The author starts by saying “A true fashion devotee strives to keep all her clothes looking as good as new. The ability to repair, revive and even revamp a garment is priceless”. The first part of this book explains how to make basic repairs in all types of materials and garments. From repairing denim to lace and all weights in between are discussed. The “Make it fabulous” sections should produce many ideas for those with a need to increase their wardrobe without too much diminution of their purse. 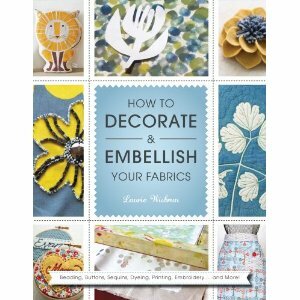 The final sections are full of tips on laundering, fabric care and a glossary on the tools used by the author. This book will inspire the modern “make and mend” woman! This historical novel is set in mid Victorian Ohio, in a Quaker settlement. 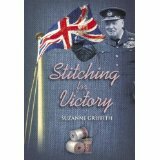 The story is mainly gentle but includes a considerable amount of detail regarding Quilt making. It appears to be the main recreational activity of the female characters when they are not growing food or hiding runaway slaves. Scraps of cloth are gleaned from many sources and contain precious memories. The period atmosphere permeates the story, and the letters from the emigrant reflect her loneliness as she makes a new life. The author shows her research in the stitching, diet and domestic conditions faced by early settlers. I enjoyed this story much more than her earlier one. It makes a good go-to-bed book and one to borrow from the library. 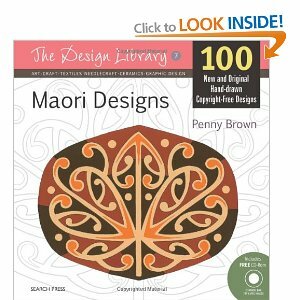 This is a fascinating design source book with a wonderful selection of 100 specially commissioned, original images inspired by the traditional art of the Maori people. 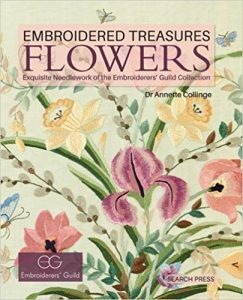 The patterns and motifs in this book are based on their stunning tattoo designs and woven work, their pottery and jewellery, and their beautiful and impressive stone, wood and bone carvings. The ultimate guide for all crafters seeking to achieve the perfect finish for their fabric-based projects. Comprehensive step-by-step instructions are accompanied by detailed illustrations that introduce readers to an extensive range of fabric alteration and embellishment techniques, such as tie-dying, block printing, and beading. Galleries throughout the book feature examples of these techniques, demonstrating how they have been applied to fabric and providing readers with a wealth of inspiration. An ideal book for both the proficient and the less experienced dressmaker. The book is divided into questions with clear photographs and diagrams of the problems. 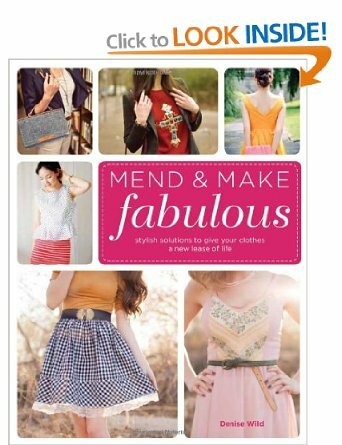 These range from ‘How do I use Tailors chalk?’ to more challenging items such as ‘How do I match the right fabric to my pattern?’ and ‘How do I cut out stretchy fabrics?’ Answers to your dressmaking problems can be solved with this very useful book. 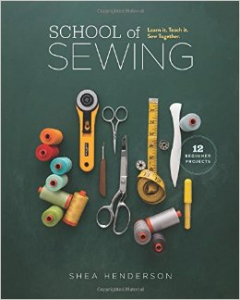 Chapters cover sewing equipment, measuring and fitting, preparing and cutting out fabric, machine stitching and lots more helpful advice for anyone who is interested in sewing. A good all round advice book. This is not a book to give pattern or inspiration but one that lets us be thankful for all the materials available to us. As a War baby I have only dim memories of Shortages or Mum making much out of little. There has been much talk about make and mend recently. This book explains how society did have to stretch existing materials and how the needle was so important. Personal accounts of youngsters stitching items makes me want to weep for the present generation that has scant knowledge of sewing or handicrafts. The few that do learn the skills, like our Young Embroiderers, will bless their instructors. All aspects of life between 1939-1950 are viewed from the vantage of sewing, from Blimps to ladies’ underwear. The Government appears to be strict but benign is sharing materials; I can remember Mum grumbling but everyone apparently did! There are many pictures, showing a collection of prized mementos, wedding dresses, toys and W.I. tapestries. A clear simple style makes the book easy to read. One to borrow from a library if you’re not a social history fan.